The City Arena is located at 701 Lake Chapeau Drive and open all year. Ice is available year-round. 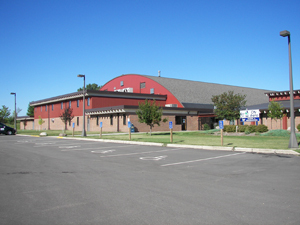 Within the facilty, you will find the Nystrom and Colstrup arenas which are home to the boys and girls High School Hockey Teams, the Albert Lea Figure Skaters, the Albert Lea Youth Hockey Association and the Waldorf University Hockey Team. Recreation programs take place year round at the City Arena. Some of these programs include Rock on Ice, Learn to Skate, Adult Hockey and Preschool Kindergarten Skate. Other activities that are not put on by the Parks and Recreation Department include dry floor programs such as banquets, indoor soccer, and dog shows. There are also four rooms at the City Arena that are available to rent for anniversaries, potlucks, picnics, parties, lock-ins, or meetings. These rooms vary in size. Call Robert Furland at 377-4374 for more information on reserving a room at the arena. For more information on the Albert Lea Figure Skating Club or the Learn To Skate Program contact 507-402-3371.